Published on Monday, April 23, 2018. This article appears in the April/May 2018 issue of American Craft Magazine. Wood for the handles of Miller’s chef and cheese knives comes from her family’s Vermont homestead and the scrap piles of her furniture-making friends. Looking at the chef and cheese knives Chelsea Miller makes from reclaimed materials, you won’t be surprised to learn that she comes from a resourceful, close-knit family. Take into account her bright voice and comfort in front of a camera, and you might even guess that the 33-year-old devoted her life to acting before establishing her Brooklyn smithy. Yet Miller’s assertion that her two divergent professions have a lot in common might seem odd – that is, until you hear her story. The knifemaker grew up on a rural Vermont homestead, where her family tended the gardens and raised the animals that sustained them. Her father was a blacksmith and carpenter, and his kids learned those skills as they assisted him in the shop attached to their home. In many ways it was an idyllic childhood, but Miller struggled with the isolation. Yearning to be surrounded by more people than trees, she moved to New York City to study acting after graduating from high school. Some 10 years later, her father was struck by a debilitating illness that limited his physical abilities. Miller returned home for a while to help him. There, she found herself puttering in the shop again, as a way to process her father’s illness, and found she hadn’t lost the skills she learned in childhood. A quick demonstration by her younger brother, who was working on some hunting knives, set Miller on the path to the successful career she continues today: knifemaker and business owner with a one- to seven-month wait list, partnerships with leading New York restaurants, and well-known chef friends such as Massimo Bottura. 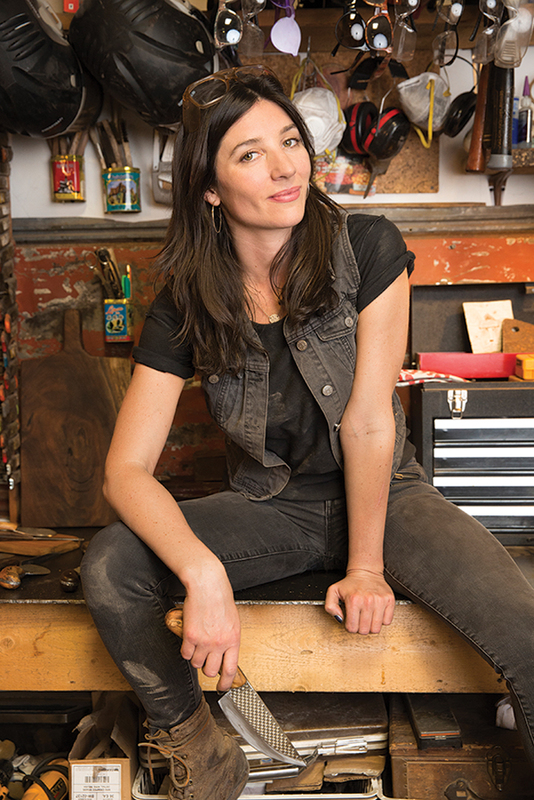 For Miller, knifemaking is another form of her fundamental passion: storytelling. Her knives are made from materials that have lived another life, making them both utilitarian tools and sentimental objects that carry memories of her family, childhood, and natural surroundings into kitchens around the world. Take her blades, formed from high-carbon steel farrier’s rasps, tools for filing down horse hooves. Miller keeps their cross-hatched teeth intact so that her blades do double duty, providing a surface for grating as well as for slicing. She remembers seeing rasps around her family’s farm; she was captivated by the elegance of their texture and design. For handles, she uses spalted maple, walnut, and applewood from her family’s acreage. “Whenever I’m there, I’m cutting into logs that have been lying around or searching through lumber that my dad had been storing for years and years,” Miller says. Her Brooklyn furniture-making friends also give her walnut scraps for the same purpose. She gathers the rasps from farriers in Vermont and upstate New York, although occasionally she orders them from a manufacturer to meet demand. Throughout the knifemaking process, Miller has the sense that her dad, who died last summer, is with her in the studio. “I always felt that he is a part of my work,” she says. “The fact that he lost so much ability in the beginning [of his illness] – I almost felt this sort of spiritual thing, where I felt like a lot of his ability, or a lot of his intentions in making things, was passed on to me.” In that sense, she is carrying on her father’s legacy, one knife at a time. It takes the Brooklyn knifemaker three to four days to produce a chef knife, which makes it difficult to churn out sets. 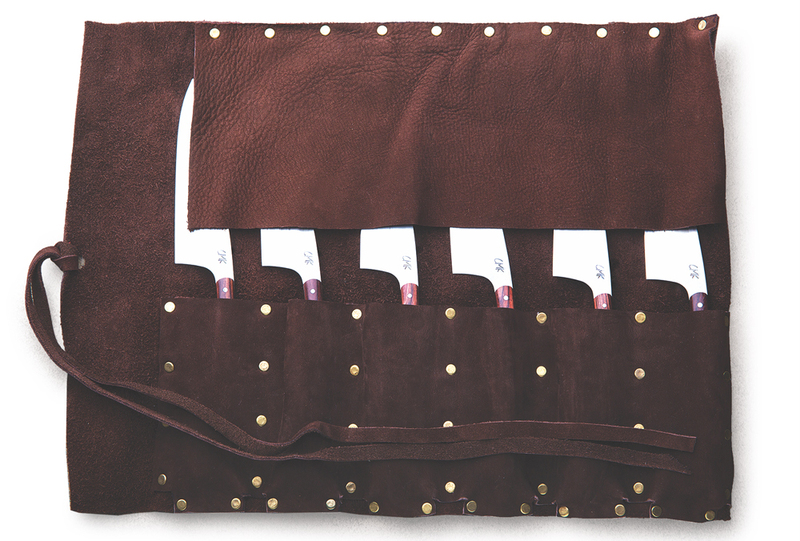 Last year, she partnered with a family owned company in France to produce this limited-edition set of steak knives. Chelsea Miller crafts knives that not only have a sharp edge for slicing but also a textured surface for grating, thanks to the raw material – farrier’s rasps. The recycled elements mean each piece tells a story.